The months of September and October don’t necessarily display the Turks & Caicos at their finest. Yes, the gorgeous seas still sparkle in kaledoscopic shades of blue under the sun’s sepia glow. Yes, fine ivory sand still carpets the quiet beaches. But the steady tradewinds may lag, and the heat, humidity, and bugs can be trying. Surprisingly, autumn is a good time for serious real estate investors to scope out the market. With fewer visitors in town, everyone — from real estate agents to attorneys to property managers — has more time to conduct business and the slower pace can be to your advantage. It’s time to secure your own piece of paradise while property is still available. After years of economic drought, the Turks & Caicos real estate market is steadily reporting strong growth in all major segments. According to the TCI Real Estate Association, the market is up nearly 28% in dollar volume for the first half of 2015 when compared to the same time period in 2014. Sold listings are up 15% and average price is up by 10%, as purchasers continue to seek quality, well priced properties. Principals at TCI Sotheby’s International Realty predict that 2015 is shaping up to be the best since the bull market of 2005/6. 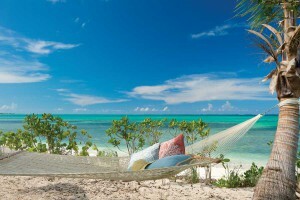 Castaway Villa is one of the TCI’s most desirable vacation villas. Having found your dream home in paradise, what is the procedure for ownership and getting the keys? Happily, after an offer is agreed upon, the process of buying a home in the Turks & Caicos Islands is quite straightforward. If you do not already have an attorney to guide you, your realtor can assist with suggested Turks & Caicos attorneys. No government license is required to purchase property in the TCI, the currency is US dollars, and there is no exchange control. There are many international flights to and from Providenciales, the country’s main hub, and visitors can now stay up to 90 days automatically. In addition to price, typical real estate buyer’s costs are stamp duty (a form of transfer tax of up to 10% of the price), land registration fees (often less than $100), and the buyer’s attorney fee of 1%, plus some negligible costs. Typically, the seller pays the realtor’s commission and seller’s own legal fees. The seller’s attorney writes the sale and purchase agreement. The buyer’s attorney reviews suitability of the sale and purchase agreement. The sale and purchase agreement is often in a format acceptable to most TCI attorneys. Financing may be through a TCI bank, secured by the Turks & Caicos property or by a bank in, say, your hometown, secured by your residence or other property. If financing is through a local Turks & Caicos bank, costs are typically a 1% bank fee, a 1% tax, and a 1% legal fee, plus some negligible costs. A buyer may acquire in his or her name, or that of a company or trust. Company ownership may be useful for various purposes, not least to limit personal liability. Trust ownership may be useful for estate planning purposes. Consider the buying entity carefully, as transfer taxes etc. may be repeated for any further transfers. A Turks & Caicos company or trust can swiftly be established. Before signing a sale and purchase agreement, review a statement from your attorney detailing the money required to close and pay stamp duty, registration, and attorney fees etc., with a contingency for reimbursing utility and management fees and the like paid in advance by a seller. Typically a 10% deposit is payable on signing a sale and purchase agreement. Note that funds sent internationally can take several days to arrive. Delays can occur with extra procedures required by your bank or intermediate banks and with weekends and holidays. After signing a sale and purchase agreement, a legally binding contract exists and so an obligation to close on the specified date (subject to any specified condition). Closing is typically 10 to 30 days from signing. The deposit is released by the buyer’s attorney to the seller’s attorney, and held by the seller’s attorney as stakeholder (honest broker between the buyer and seller).During the interval before closing, the seller’s attorney provides the buyer’s attorney with title and other appropriate information for the particular property. Typically, more information is required for a condominium than for a villa. The attorneys agree on closing documents and obtain signatures in advance of closing. The closing documents are signed before a notary in either Turks & Caicos or elsewhere. A notary is usually an attorney, but conveniently, many Federal Express offices in the United States provide notary services. A buyer (and seller) need not be physically present in Turks & Caicos for closing if required closing documents can be couriered internationally, signed in advance, and held in escrow. Alternative arrangements can be made for pre-closing inspection. Such inspection is typically made by the realtor, on a buyer’s behalf. At closing, attorneys typically meet for exchange of money, documents, and keys. After closing, the buyer becomes the owner and the buyer’s attorney arranges for stamp duty and registration formalities. A buyer should have arrangements in place to transfer over utilities including water, electricity, broadband, etc. Typically, for an international buyer such arrangements are made in advance with a property manager. Buyers planning to rent out their property are advised to consider local management. Buyers often choose to continue existing local property management. New to the market and growing in popularity are “managed villa properties,” which combine the management operations of a condominium with the privacy of a villa in a secure, gated community. An attraction to pre-construction villa sales is that stamp duty is payable on the land value only and buyers have some input into custom design options. New developments in this category include The Shore Club Villas, Beach Enclave Long Bay, Gansevoort Villas on Turtle Tail, and The Dunes in Turtle Cove. Except for a 12% government tax on rentals and for transfer tax mentioned above, there are presently no other real estate taxes in Turks & Caicos. Any person or corporation operating a business, including property rental, may be obliged to hold a Business Licence. Business Licences are renewable annually. The present cost of a Business Licence for a single rental villa is $400. The procedure from start to keys can be under one month, or even sooner if the parties require. Before proceeding with any real estate transaction, you are advised to instruct an attorney. If you have any queries, Neil Molyneux and the team of attorneys at Graham Thompson are happy to help. Neil Molyneux is an associate with Graham Thompson, is called to the Turks and Caicos Bar, was called to the Bermuda Bar in 2009 and admitted as a Solicitor in England and Wales in 1994. Neil has over 20 years legal experience in all aspects of real estate, and most recently in high end residential real estate acquisitions, in the second home market, particularly for private clients from North and South America. He can be reached at 649 339 4130 or at nrm@gtclaw.com.